Braided lines has become so popular. So we have to know how to tie it to leaders, lures and hooks. If you are not using traditional monofilament lines any longer, the "Berkley Braid Knot" is one of the best for this kind of material. It was developed to retain good knot strength and to stop braided lines from slipping out of the knot. Pollock is usually caught in deep waters from the boat. But there are also other ways to fish them without sailing into rough waters. You can go pollock fishing with simple plastic lures and easily cast it from the shore, too. This guy has got a "Jacks Prowling Shad" in his bag. It looks pretty effective and easy to use. And obviously big beautiful pollocks loves it, again, if you know how to use it properly. This is the strongest "loop knot" for fishing. Most of the anglers use this knot especially for saltwater fishing. But I use it for almost every kind of fishing. For example I always prefer "Kreh Loop Knot" for fly fishing. It gives freedom to the hook and this is really important especially if your target fish are very shy. And I strongly suggest this loop knot for unweighted rigs to use at the beach or shallow rocky waters. Those rattling fish around the rocks and pebbles love to bite freely falling baits. Try it, you will see how effective it is. Simple rock fishing is an amazing fun, if you know how to do it properly. Australia is a paradise for rock fishing . It's coasts are just perfect for weekend escapes with a simple rod and a hook. Plenty of fish everywhere and easy to catch. You don't need very expensive and complicated fishing equipment. Leaves the most attractive rules at home. Natural bait and unweighted drifting rig will make your day. Let's see how this Aussie doing it. You will wish you were there. 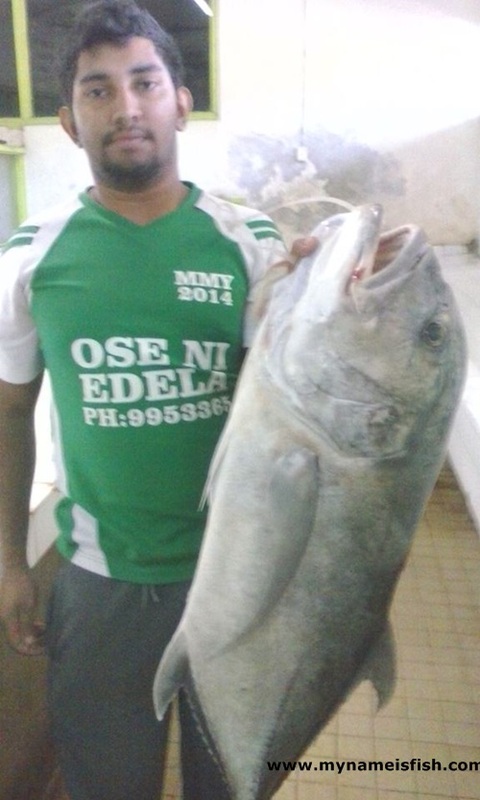 16kg Trevally from Fiji. This is Zoheb, he lives in Nadi, Fiji . This guy loves fishing and he always catches big ones. He sent this photo in June 2015. 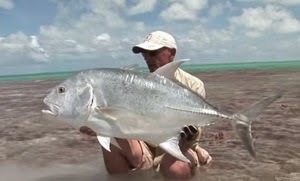 Look at the beauty of the gigantic trevally. Its 16kg, about 35lbs. Good catch, well done Zoheb. Making spinning lure from a penny is so easy. Let's see this simple instruction to learn how to make one. There are millions of different lures for both freshwater and saltwater fishing. Online tackle shops are bombarding anglers' eyes with many different type of them from all around the world. But you can still make your own special lure from a coin that you keep carrying all the day in your pocket. We all know that sometimes simple and cheap lures work much better than gorgeous looking expensive ones. If you want a very strong knot to tie -especially different size of lines- for all kind of rigs or fly gear or light casting, this is what you exactly need to learn. "Blood Knot" is one of the most difficult looking but actually easiest knot for enthusiastic fisherman. Four words describe is best; smoothness, strength shape and versatility. Just try to do it slowly as it's shown in this video. Once you make it, then you will do it even blindfolded. Here the most detailed instructions for tying a Blood Knot.